Position a rack in center of oven and preheat oven to 200°F. Line a sheet pan with paper towels. Peel potatoes, then shred them with a food processor fitted with a grating disk with large holes, or use large holes of a box grater. Working over a small bowl, squeeze potatoes to remove excess liquid and transfer potatoes to a large bowl. Set bowl of potato liquid aside for 5 minutes. Shred carrots in food processor (using grating disk) and add to bowl with potatoes. Grate onion with same blade—it will be almost puréed—and add to potato mixture, discarding any large shreds of onion. Carefully pour off all reddish potato liquid, leaving paste-like potato starch in bottom of bowl. Scrape starch into shredded vegetables. Add eggs, bread crumbs, salt and pepper and mix well. Pour ⅛-inch oil into a large skillet and heat over medium high heat until shimmering. 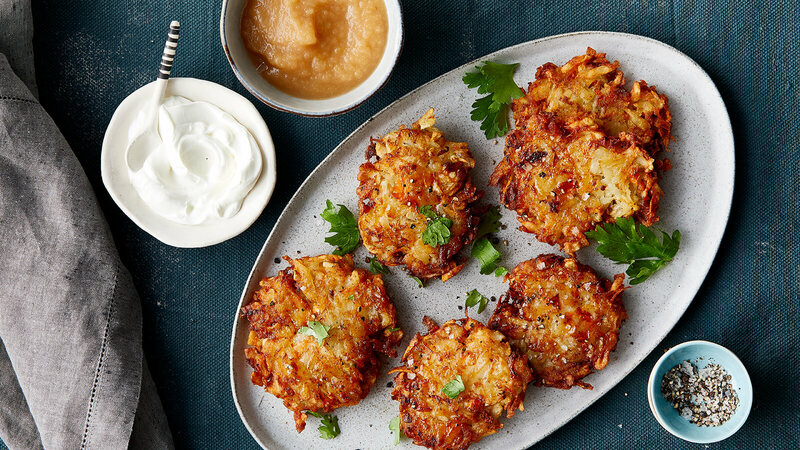 Carefully add about ⅓ c batter for each latkes to oil, using bottom of cup to spread each into a 4-inch latkes. Cook until golden brown on bottom, about 3 minutes. Turn and brown on second side, about 3 minutes more. Using a slotted spatula, transfer to paper towels and keep warm in oven while making remaining latkes. If needed, add more oil to skillet and heat before cooking second batch. Serve hot, with sour cream and applesauce.